Some fresh sketches as promised. My wife and I took off for the weekend and went out to Winthrop. 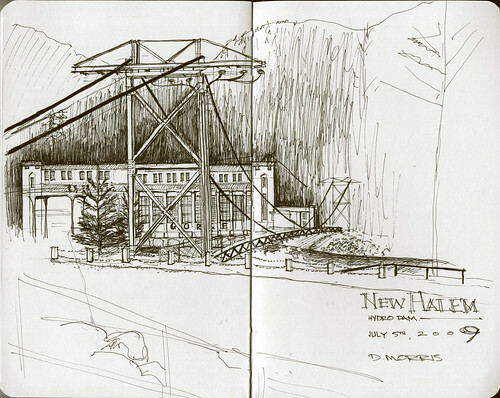 The first sketch is from a suspension bridge on the north side of Winthrop. There is an irrigation ditch / canal that was on both sides of the river that fascinated me. It ran right through the town and the difference in grade change between the street and the canal was so subtle that the canal appeared to be flowing uphill! Just that it was flowing through town was cool enough for me, but this just added to the mystery. It reminded me of a place called Irish Springs back in Michigan. 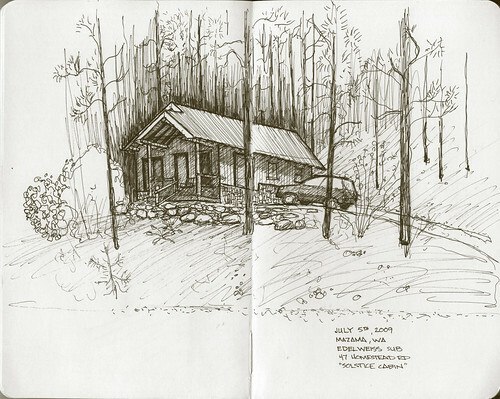 This next sketch is of the cabin we stayed in in Mazama. I saw a black bear about a mile or so down the street from here, close to the Mazama general store. It crossed the road right in front of me. This area reminded me a lot of Montana, particularly the areas outside of Missoula. Lots of Ponderosa Pines. 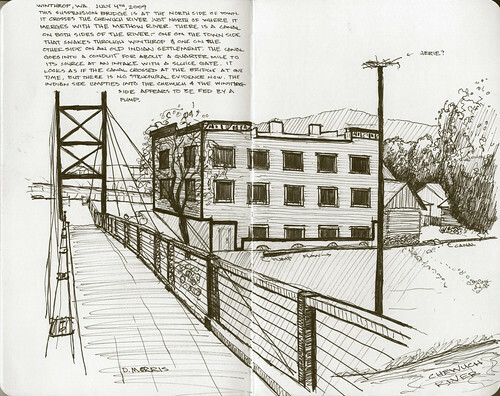 This sketch was up the hill from downtown Winthrop. It is of some old mining equipment at the Shafer Museum. Very nice stuff. The smells reminded me of my grandfather's garage. This last one is in Newhalem. It is of the hydro-electric dam there. I could spend a week up there sketching and not get bored. Wow! Great renderings of this area. Thanks for sharing your holiday with us! Thanks Beth. 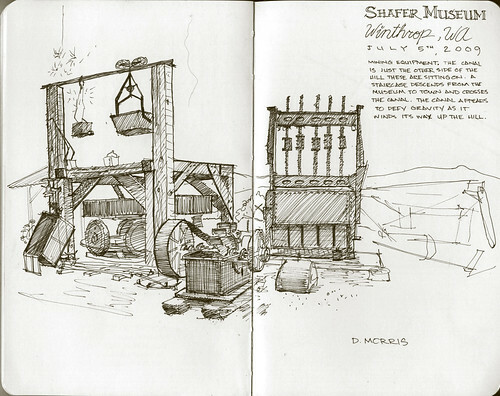 It was nice to have some time to sketch as well as some interesting subject matter. I wanted to do a series of sketches about the canal. It was by far the most interesting part of Winthrop. The Seattle City Light hydro electric dams are equally fascinating.